Right now, the 2018 season is far enough away to stave off any anxiety for the team. Camp is coming close to full swing, so pre-season expectations are still formed from the end of last season. Expectations are high after a successful campaign, but exacting those expectations will be done over the next few weeks. We all know that Auburn does their best when they “fly under the radar”, however, the last 10 seasons haven’t been too bad for the Tigers. Starting in 2008, the Tigers are 8-2 in their first matchup of the season, including going 3-2 against power five teams (stupid Clemson). Take a look below at the last 10 season openers. I don’t have much nice to say about Tony Franklin and his time at Auburn. He promised the world and delivered nothing. Auburn came into this game with a top 10 ranking and had a fancy new offense. Expectations were high as Auburn was supposed to take the SEC by storm with their new “spread” offense. Hindsight tells us that didn’t happen as Tubbs isn’t the coach anymore. Chris Todd was underwhelming in this game going 9-18 for 70 yards with 1 touchdown and interception. Ben Tate carried 13 times for 115 yards. Auburn jumped out early with an Antonio Coleman sack fumble and recovery for TD by Michael Goggans. Robert Dunn also had a 66-yard punt return touchdown. Gene Chizik’s first game was a great one. Going into this game, everyone was taking a “wait and see” approach. This game lead Auburn to a quick 5-0 record before suffering to their first loss at the hands of Arkansas (only because they had Malzahn). Chris Todd found a rhythm early and was 17-26 for 255 yards and 2 touchdowns including a 93-yard bomb to Terrell Zachary, but it was true freshman Onterio McCalebb that stole the show rushing for 148 yards and 1 touchdown. CAM. NEWTON. Everyone thinks that South Carolina was Cam’s coming out party. However, he was ballin’ since week one. He had 186 yards passing with 3 touchdowns AND 171 yards rushing with 2 touchdowns. Yes, Cam did have some great plays, but his first game is often overlooked. Auburn fans started the day upset that the defending National Champions, a team with a 15 game win streak, was ranked 23rd to open the season. They ended the day upset because Chuckie Keeton did all he wanted with the defense. Seriously, this game was so bad, Auburn needed 2 touchdowns in the last 2 minutes to get ahead of UTAH STATE. Barrett Trotter had 261 yards and 3 touchdowns, but we only remember Michael Dyer sneaking into the end zone with 30 seconds left. Auburn had high hopes for this game. Kiehl Frazier had all the pre-season hype. 14th ranked Clemson lead by Tajh Boyd was no easy task, and the Tigers did have a lead in the 4th quarter 19-16, but the offense sputtered late and couldn’t get a score as Clemson pulled away late 26-19. Cody Parkey was the real MVP going 4/4 on field goals with a long of 46 yards. This game was fun. 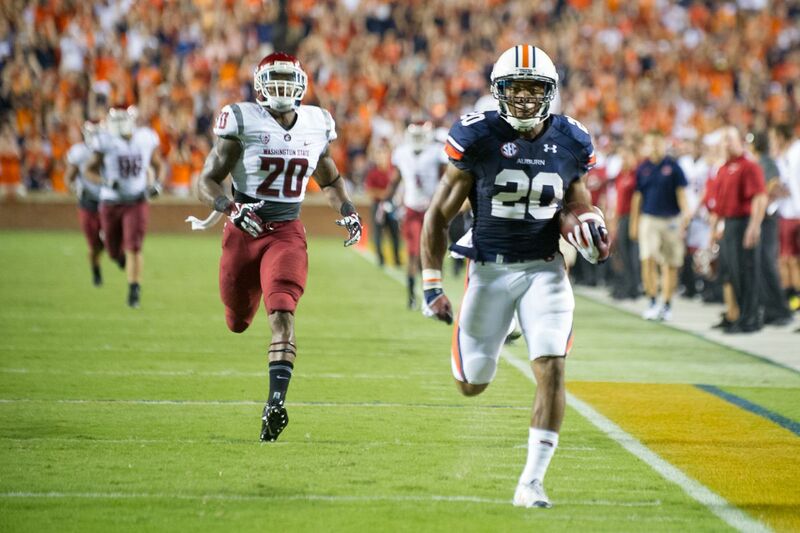 We didn’t see the talk of 2013, which was the read option in the Auburn offense, but what we did see was Tre Mason, Cameron Artis-Payne, and Corey Grant BALL OUT. Nick Marshall only had 97 passing yards which caused Washington State’s QB to throw shade at the tigers. What he didn’t know was that Auburn would end the season as a top 5 team with the most painful loss in Auburn history. This game… Jeremy Johnson played the first half because of Nick Marshall’s suspension. I can still see him staring down all the receivers in this game. The game was tied at 21 at the half and you could hear Bret Beliemia oinking on the way to the locker room. Now, after the lost the game, he did complain that his assistant coaches couldn’t get to the locker room, but it was his team that didn’t score in the second half and gave up 24 points. I’m guilty of buying into the Jeremy Johnson hype; however, he did stare down every receiver in this game which lead to 3 interceptions. This game was won by Will Muschamp and his defense. Auburn beat up on Lamar Jackson holding him to 206 total yards, 1 total touchdown, and an interception. Look how ugly Louisville is. Can we stop playing Clemson in sports? Seriously. I know we hold the series lead, and it isn’t even close. I’m just tired of them being on the schedule and losing to them. This is the game that Gus knew better than everyone and rotated the QBs every down. as has been the case in most of Auburn’s games since 2015, the defense kept the Tigers close, and even had a shot at winning the game on a hail mary at the end of the game that fell to the ground. Kerryon Johnson had a solid effort before leaving with a leg injury. Johnson had 136 yards and 1 touchdown, but he’d have easily gone over 200 had he stayed healthy. The biggest thing about this game was the defense. Georiga Southern has given power-5 teams absolute fits in the past, but Auburn held the Georgia Southern triple-option attack to 70 yards rushing and 8 yards passing. Auburn has fared well with preseason expectations, especially under Malzahn. What are your expectations for the 2018 season? Let us know in the comments! ← Will Newton Match Auburn Success at Panthers?